We get more visitors to our Bugs site looking for information about spiders, spider identification and spider bites than just about any other topic. Most people have an innate fear of spiders and believe that most are dangerous; even small spiders provoke this fear. The truth is most are harmless or even beneficial and the few that do have a venomous bite may not be as dangerous as we once believed. In the US there are three spiders that get blamed for most of the so called "spider bites" that end up in emergency rooms. Where you live largely determines which species gets the blame. The three common culprits are: brown recluse, black widow, and hobo or aggressive house spider. Brown recluse spiders are only found in the south central US. Researchers have tried to find specimens of the spider outside this range but have repeatedly failed. Despite the lack of actual spiders, even the medical community continues to report bites and ulcerating ("flesh eating") wounds attributable to brown recluse -- what's going on here? Turns out there's a skin bacteria called methicillin-resistant Staphylococcus aureus, or MRSA that causes open, ulcerating wounds that researchers now believe accounts for many of the wounds that were once attributed to brown recluse spider. Wounds are very red, tender and very slow to heal. Bites from the other "flesh-eating" spider, the hobo spider, which is found mainly in the Pacific Northwest, and often misdiagnosed as brown recluse, results in similar wounds. The MRSA bacteria may well be involved with reported injuries from this spider, too. Hobo spiders are not even considered to be venomous in their native range in Europe. To confirm a MRSA infection requires a laboratory culture and several days. Most physicians won't bother because in the end the treatment (spider bite vs. bacterial infection) is the same. On the other hand, black widow spiders, which occur throughout the US, have a venom that acts on the central nervous system and can be very dangerous, even life-threatening. Black widow bites do not result in ulcerating wounds but rather affect muscles and nerves. Pain, tremors and breathing difficulty often set in within minutes of a black widow spider bite. If you believe you have been bitten by a spider try to collect the specimen and have it identified. 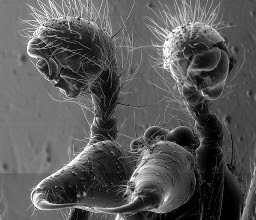 The electron micrograph photo above was taken by Marc Castagna. The image shows the fangs (inwardly pointed "chelicerae" in lower part of photo) and pedipalps (upper, "boxing gloves") of a spider. In life the fangs are only about 1/32". Every once in awhile I get an e-mail with a question about the "small, black bugs that seem to be coming out of the drains in the bathroom and kitchen". These are called drain flies (see photo) and are common and usually no reason for concern but it may mean it is time to clean out the "gunk" in your drains! 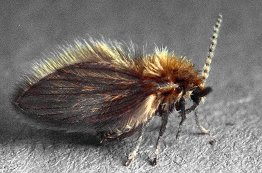 Drain flies, also called moth flies (another image of drain fly) are small (~1/10") hairy flies that are commonly found in kitchens and bathrooms. Larvae of drain flies can develop in the organic, gelatinous material that builds up inside pipes and hence can be very common around sinks. They are also common outdoors near sewage plants and waste ponds. Adult drain flies are covered with scales that makes the fly look like a tiny moth. Flies may be attracted to lights and windows. Eggs are laid on the gelatinous film that forms in pipes or in sewage treatment facilities. Larvae develop in this rich organic material. The drain flies are harmless but a close relative, the sand flies, actually transmit a serious disease called leishmaniasis. Leishmaniasis does not occur in the US. Fly numbers can be reduced by removing the organic, gelatinous material that forms inside drain pipes. You can use a stiff brush or one of the relatively new bacterial/enzyme-type drain cleaners. Regular use of a drain cleaner will remove the layer of gunk and prevent fly development. There's no reason to use insecticides. 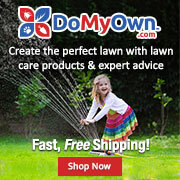 Foaming-type chemical drain cleaners will work as well. Don't use the bacterial/enzyme-type drain cleaners on clogged drains. For drains that are clogged you'll need a chemical drain cleaner or plumber's snake (or a plumber). The bacterial/enzyme cleaners are only intended to remove the organic film (gunk) that forms on the walls of drain pipes and such.